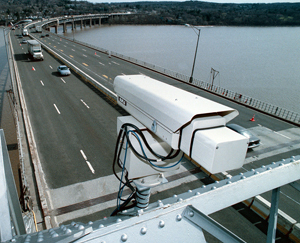 As a part of its continuing effort to enhance customer service, the Authority is now offering official members of the media a direct connection to Thruway traffic camera feeds and or still traffic camera images for use in media traffic reporting programs. Until now, these cameras were used for internal traffic monitoring purposes only. The Authority will share its traffic camera feeds with media outlets free of charge for the use of the images as a benefit to the traveling public. If a media outlet needs to utilize Authority property in order to establish a connection to the camera feeds, such use of Authority property must be in accordance with the Thruway Real Property Management Policy. Pursuant to the Policy, a media outlet may need to obtain Occupancy and/or Work Permits. The Authority will maintain complete control over its Closed Circuit Television (CCTV) images at all times and reserves the right to terminate a feed at any time without prior notice. The media will not be allowed to use Authority CCTV images for any purpose other than traffic reporting. At this time, the Authority reminds media outlets that the traffic camera feeds are provided “as is” and “as available”. The Authority does not make any guarantees that any camera feed will be maintained to a standard of quality. The Authority does not guarantee that any camera feed will be uninterrupted, error or defect free, free of viruses or other harmful code, or secure, or that problems will be corrected even if the Authority is on notice of such problems. Operation, maintenance and repair of the cameras will be done on a schedule determined by the Authority, and therefore all of the cameras may not be available for viewing and/or broadcast all of the time. If you are a member of the media and are interested in participating in this program, please review the Network Connection Agreement prior to completing the External Network Connection Request and Application for Traffic Camera Broadcast to begin the process of establishing a direct connection to Thruway traffic camera feeds.